In order to access SFTP you will need a third party program to connect to our servers. We recommend https://filezilla-project.org/ as it is straightforward to use and has all the features you will need. NOTE: All other SFTP client software will work as well. Step 2: Open up the software and use the details found under Configuration > SFTP Settings on the panel to log in. This is what the information will look like to login with. Your Connection Address is Host, Username is the username and your password is the same as your password using when logging into the panel. You do not need to enter a port, if you entered the entire connection address, the port will fill itself. Step 3: On the bottom right you will see all your server files. To download all your server files you can just download the folder data. To reset your server, highlight data and press delete. You are now seeing all your files from the panel on your client. There are many things you can do from here. To upload files, you first find the folder/file you want to upload in the bottom left box. Once found you can simply drag the file into the file data, and the client will upload all the files. Make sure it is in the data folder and where you want to upload it on to your server. This does work for files, it will upload everything from inside the file for you instead of you doing it one by one. 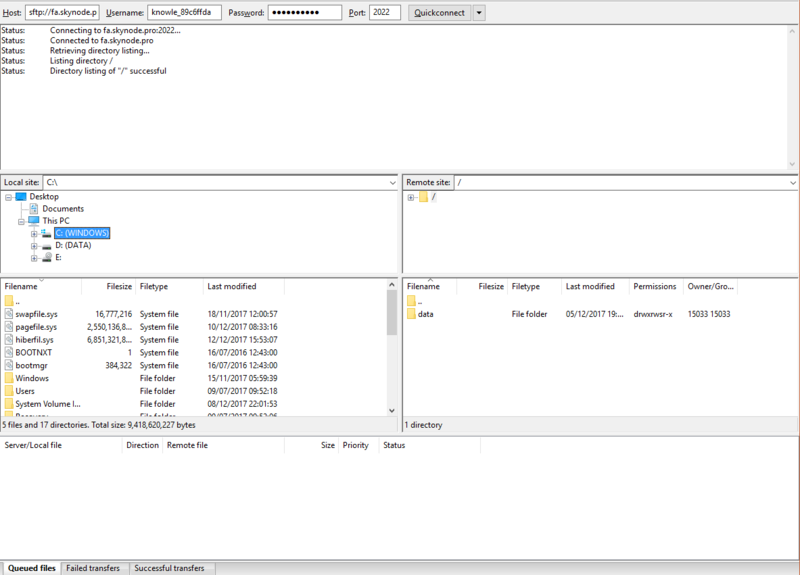 The same works for downloading, just find the folder you want to download it from and drag it from your server files to your computer&apos;s files. All done! Enjoy your new server management system.